These cascading pools of Semuc Champey are hidden between the steepest green hills in the north of Guatemala. As incredibly beautiful this place is, as hard it is to get there. Rough, rocky roads with grades aroun 15 - 20%, the steepest I have ever cycled. I had a problem with my derailleur - it was bend because it took a hit - so it was impossible to do these roads with malfunctioning gears. The chain constantly hopped in between the wheel and the cassette and touched the derailleur while gearing up, I was afraid to break it. I asked around for a collectivo (shared taxi), towards Lanquin, the town nearby. The bike got strapped on top. 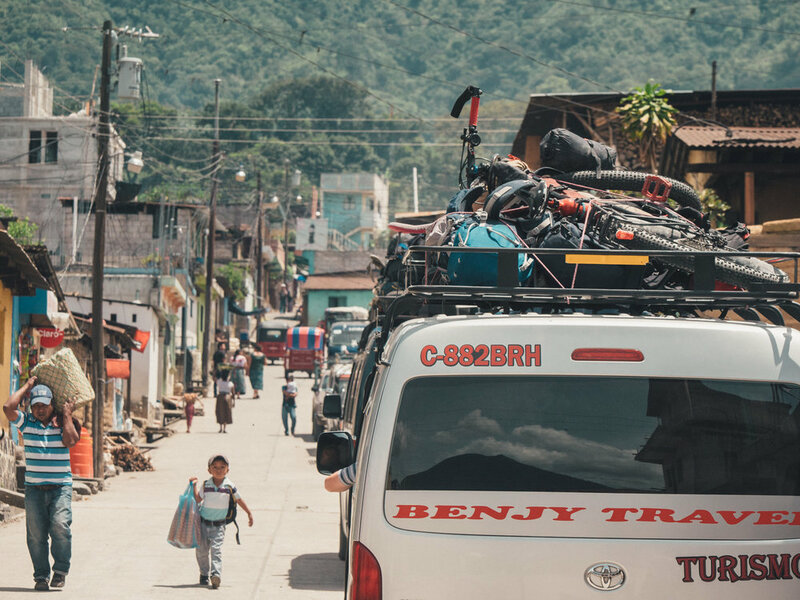 The ride in the van was perhaps even more uncomfortable, I got the feeling that any time we could tip off the hill, with the heavy load on top. The driver hardly adjusted his speed to the rough road surface - a road that in Europe would qualify as 'four wheel drive' - which made everyone 'head-banging' unwillingly while holding on the seats. 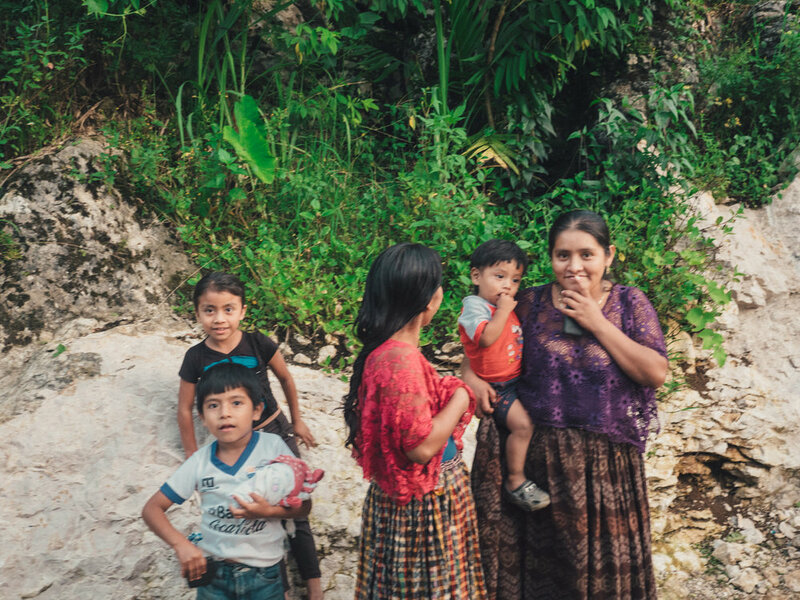 We passed through remote Maya villages, with women and girls all dressed in traditional clothing, staring at the white people in the van that passed. Lanquin is the connecting town nearby Semuc Champey, which on itself is a dead-end in the jungle. As soon as the van stopped a swarm young guys from local hostels approach the van to convince tourists to come to their hostel, which included transportation. In a chaotic situation with three guys around me, trying to sell me a room, I forgot about my two rear panniers. Before I realised they were not on my bike, the van had left with my bags inside, including all of my clothes and most of my camping gear. After asking around someone called the taxi service and drove me to the office, where luckily I found my bags. A sigh of relief. I chose a hostel and the next adventurous ride started over the narrow roads. It took 45 minutes to do the remaing 10 km to the river. The next morning I visited the park early. 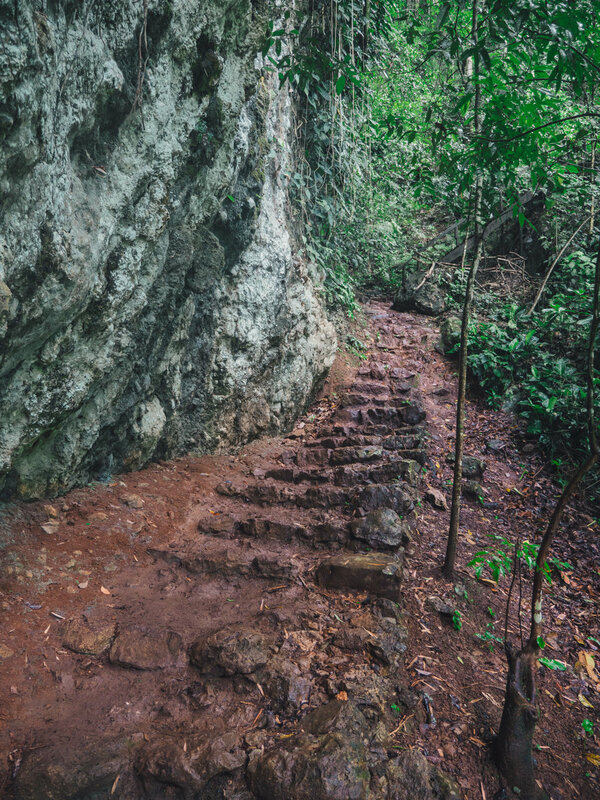 A steep trail with stairs headed up to a viewpoint (first photo) which gives an incredible view over the natural pools and surrounding hills. On the way locals were trying to make some money selling fresh coconut juice. A hot climb, but nothing too difficult, and once back down you can take a refreshing swim in the translucent water. The limestone pools are actually a natural bridge covering the brown river Cahabon which flows underneath. Some of the water flows in the pools leaving a deep blue colour.